Dragons are usually sleeping, and that’s how you can make your living. You just have to sneak in, grab a few things, and get out. What are the chances that the dragon will spend his five minutes awake, expending his remarkable fury, while you’re there? What are the chances that the dragon will care about the few jewels lining your pocket? Well, the odds were a lot more in your favor before flatfooted Don arrived, uncovering bones at every turn and lugging gargantuan treasure chests toward the cave entrance. Can you make it out with the most loot before the dragon awakes? Find out in Hoard! 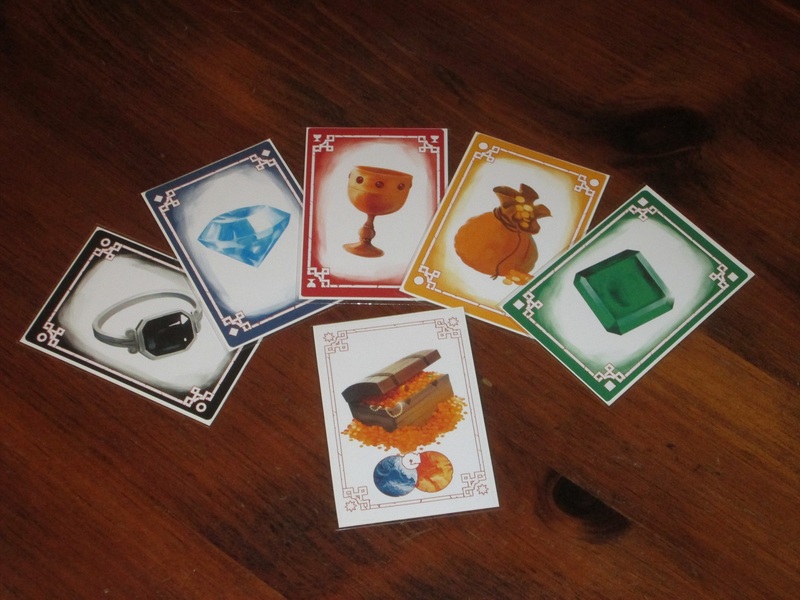 Hoard is a set collection game for two to five players. Players move around the dragon’s hoard collecting sets of treasure before the dragon wakes up. The first player to five points is the winner. 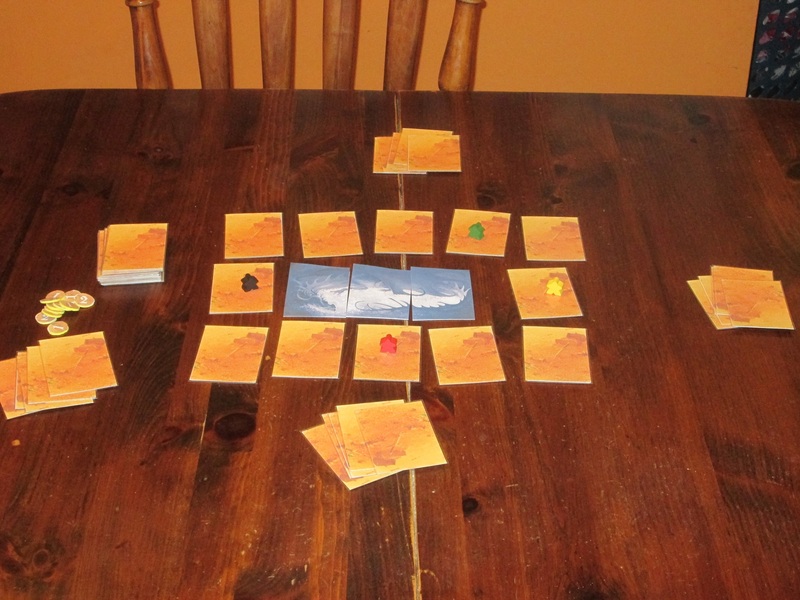 The setup for a four-player game of Hoard. To begin, place the three dragon cards, sleeping side up, in the center of the table. 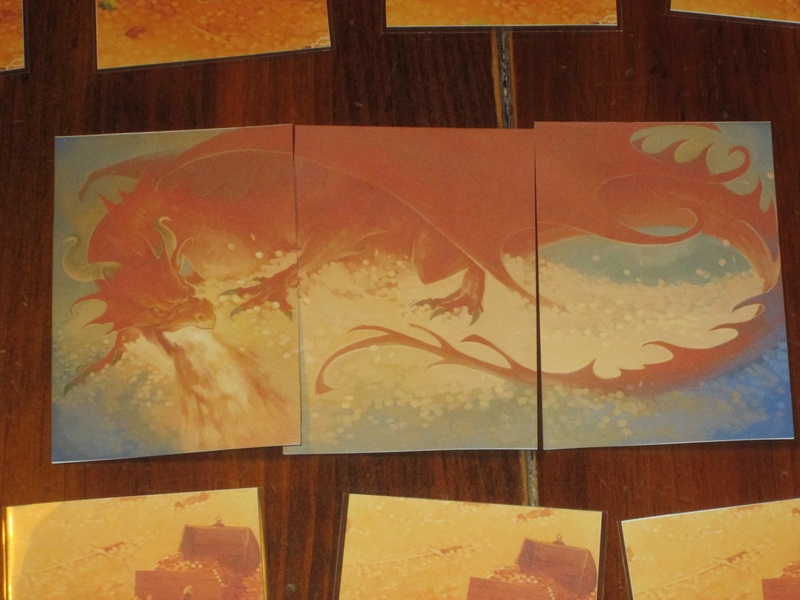 Then place twelve cards from the treasure deck in a circle around the dragon. 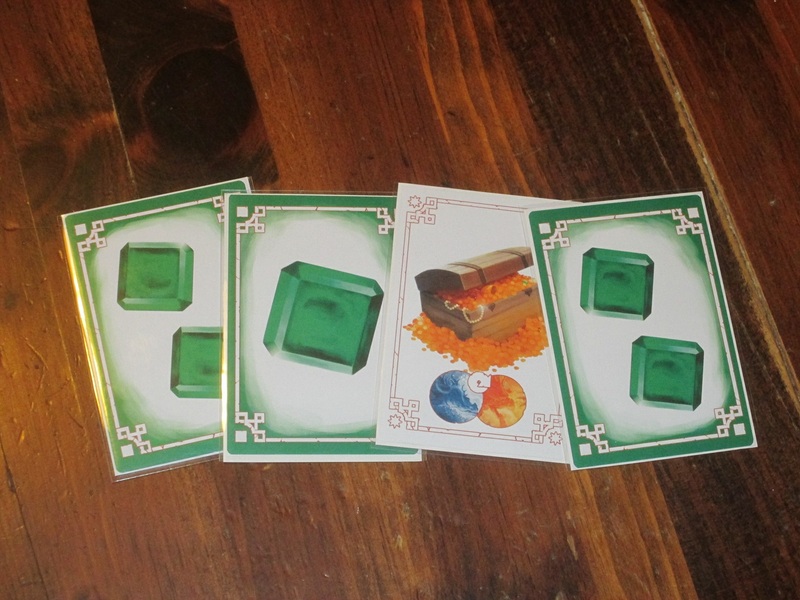 Each player receives a hand of five cards and places the token of their color on any of the twelve cards. Players peek at the card their token is on. On their turn, players may take one of four possible actions: 1) move/draw a card; 2) meld/extend a set; 3) play a dragon card; or 4) play a sword or shield card. If a player chooses to move, he or she rolls the included custom die. The player moves that number of spaces clockwise or counterclockwise and looks at the card. 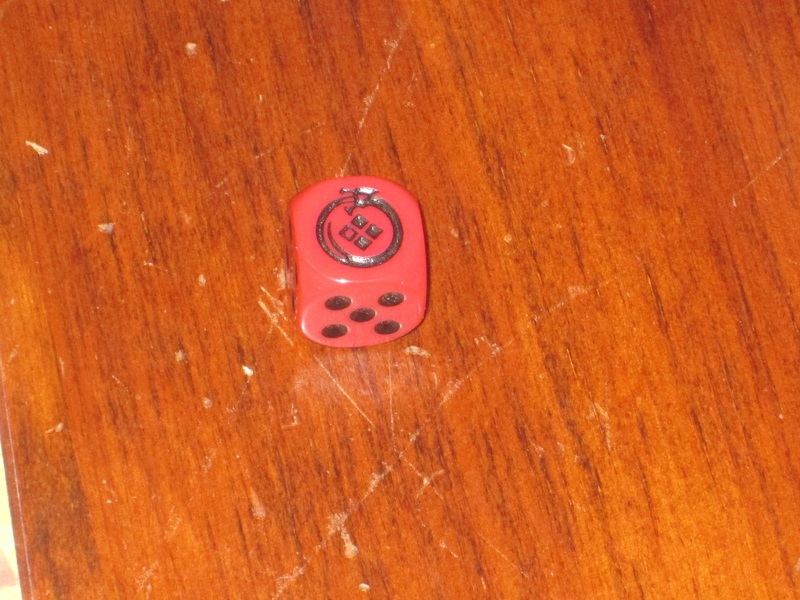 (There is a custom face on the die that, when rolled, allows the player to move up to five spaces or stay where they are.) The player can keep the card, replacing it with a card from hand or from the deck, or the player can put the card back and draw a new card from the deck. Melding a set requires a player to place three objects of a single type on the table. To extend a set, a player must place at least two additional objects of that type on the set. Playing dragon cards either wakes the dragon up (“Bones!”) or puts him back to sleep (“Shhh!”). Treasure chest cards (which act as wilds in melding/extending sets) also wake the dragon. Finally, a player may play a sword card against any other opponent. 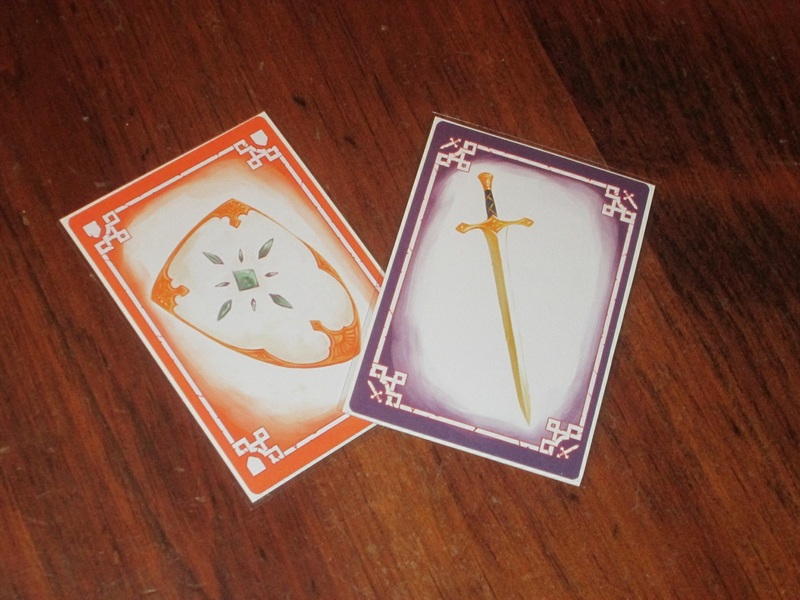 That player must allow the sword player to look at his or her hand and either choose a card, give a card, or both, unless the victim has a shield card in hand, which cancels the sword and grants a point. The round ends when either the dragon wakes up, the draw deck is depleted, or a player has no cards at the start of his or her turn. Players get points for each treasure card they’ve played, for sword/shield combos, and for sets of three dragon cards. The player with the most points receives two victory points; the player with the second most points receives one. The game ends when, after any round, a player has five or more victory points. The player with the most points wins. Set collection games–at least among my theme-loving friends–are often viewed as boring affairs of peacefully gathering cards and laying them down, with someone declared as winner at the end. Of course, my theme-loving friends have already checked out by this point and don’t really care who snagged the victory. 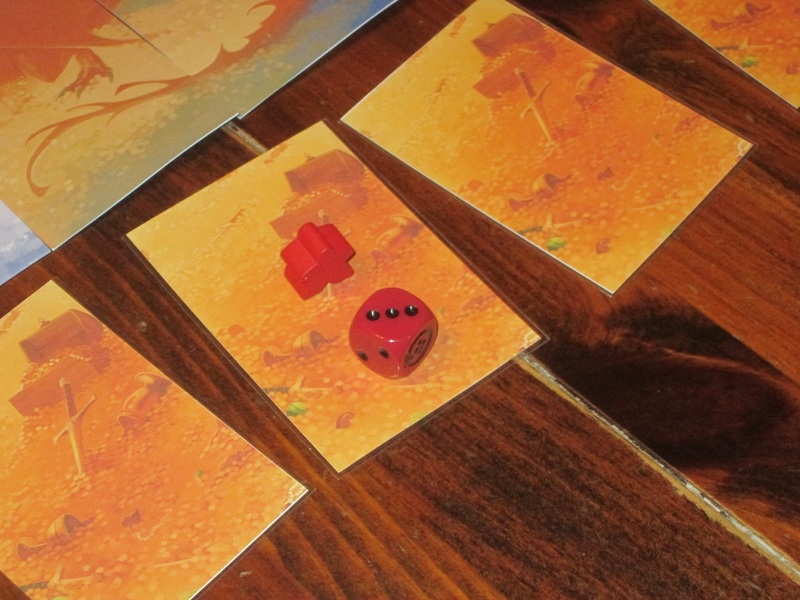 Hoard attempts to forge several strands into a single game: set collection, roll and move, press-your-luck, and thematic flavor. And it mostly succeeds. Swords and shields? This isn’t your mama’s set collection game. Bones! (“Eek!” in the final version) cards wake the dragon; “Shh!” cards lull him back to sleep. The dragon’s waking leads to another interesting aspect of Hoard: the variable round length. Players can never be quite sure when a round will end, so they have to secure their gains while they can. There’s a certain element of pressing your luck in Hoard that I enjoy. Do I hold my cards, waiting to meld them all at once? (It’s difficult to extend a set once melded.) Or do I lay down cards at the first opportunity, just in case someone steals my cards with a sword or ends the round early? The treasures available in the dragon’s hoard. The swords themselves are an exercise in risk evaluation. The rewards of using a sword can be great–you get to look at another player’s hand and either steal, give, or give and steal a card from that player. However, if the targeted player has a shield card in hand, the sword is powerless and scores the other player a point. Players have to balance the potential reward against the potential setback. There are only three swords in the deck, and only three shields: what is the likelihood that another player is holding a shield when you strike? I like this dynamic quite a bit. A sample set of emeralds. Sets have to have at least three objects when you first lay them down, and you can only extend a set with at least two objects more. This makes players reconsider simply melding once they have the cards. I also like that no matter how well a player does (or how lucky a player is) within an individual round, that player can’t earn more than two victory points toward the five required to win. This keeps the scores manageable, and rarely does a player ever feel completely out of the running. Even if a player has a bad round, he or she might come back in the next. Victory doesn’t often seem beyond your grasp–at least until the game is drawing to its conclusion. What I’m less keen on in Hoard is the luck. There are some games in which luck doesn’t bother me much. As long as players are aware of their chances and have reasonable means of mitigating it, or as long as the game is silly and lighthearted, the presence of luck isn’t a deal breaker. What makes the luck in Hoard a little harder to swallow is the huge swings that can take place, making it hard to plan. I may have cards in my hand that I need for a set, only to have them stolen by a sword, and if I am unlucky enough not to have a shield, there’s nothing I can do about it. I may need one more turn to play the cards I need for a set, but the next three players might play treasure chests or dragon-waking cards. Now, these moments of powerlessness don’t last long, and they aren’t completely damaging to the game (especially since some of this is expected when you press your luck), but they do impact my eagerness to play. Players move around the hoard using the included die. The thing I enjoy least about Hoard is the roll-and-move method of collecting cards. Finding the cards you need is already difficult, as drawing from the deck and finding cards around the hoard has a large dose of luck already. The addition of rolling what you need on a die to get the cards you want is a little too much luck for my taste. I think the memory element in the game (and thus the skill required to play it) would be stronger if players could choose which space to go to each time they took a card, but they couldn’t stay still. Thankfully, a change like this is easy enough to implement if you find yourself in the same boat as me. And moving around the Hoard–by die or otherwise–is thematic, so it makes sense. 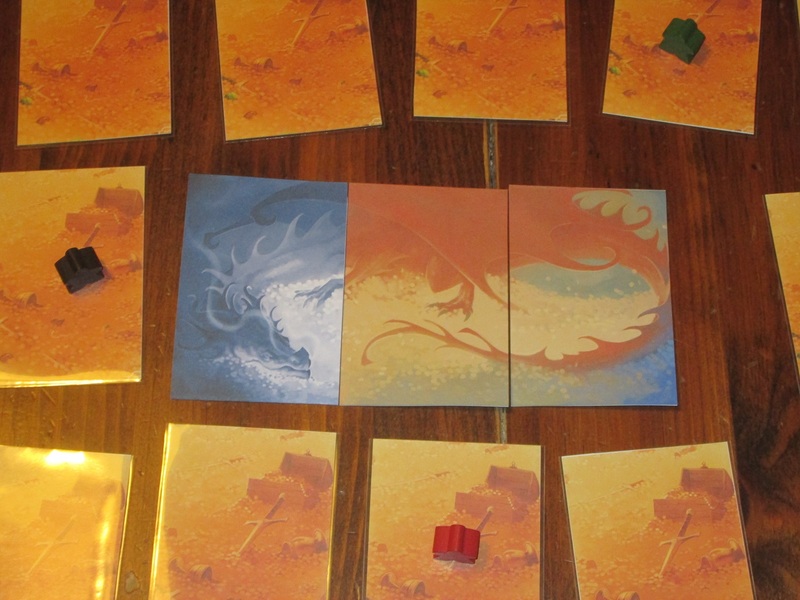 I can’t comment on the final components for Hoard, but I do like the prototype artwork. 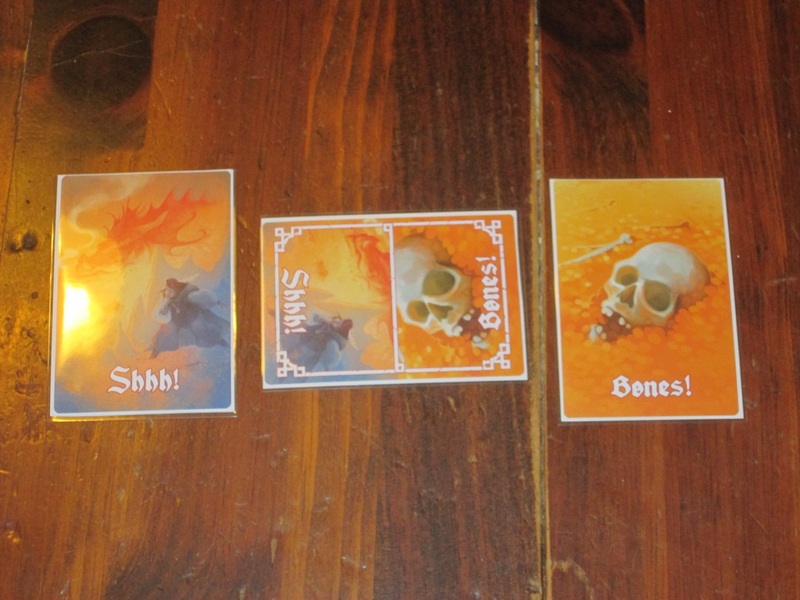 It’s lighthearted and not over-the-top fantasy, and the card design is clean enough to easily tell what you’ve got. The game includes a custom die, which is a nice touch. The dragon is awake! Hope you got the loot you wanted because it’s over now. Hoard isn’t usually my kind of game (dragons, luck), but I still enjoyed it. It has some take-that elements that aren’t out of hand, and it’s a fun way to pass the lunch hour with friends. I prefer my set collection games to have more control, but Hoard will work well with people who want more thematic flavor than the newest rummy variant. I have one friend in mind who I know would not come within fifty feet of my favorite set collection games, but Hoard is right up his alley. If you’re looking for a thematic set collection game with some skill and a lot of fun changes of fortune, Hoard is for you. Hoard is currently on Kickstarter, seeking publication through Cheeky Parrot Games.